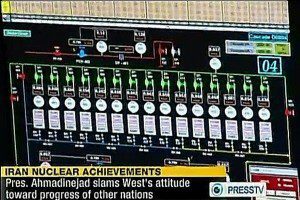 Last year we showed a slightly edited screen shot of a popular Natanz SCADA display as it turned out that the (classified) actual cascade shape was hidden in that photo. We used red lines to highlight the boundaries between the individual enrichment stages. It appears that somebody in Natanz read our blog post and thought: Wow, those red lines make the display much more user friendly, so let’s incorporate them as a standard feature in our screen design. Which is what they did. In February 2012, Iranian TV aired several news clips about Natanz. In one of them, a SCADA screen of the new 17 stage, 174 centrifuge IR-1 cascade is shown. Look closely at the familiar four rows of green dots at the top that make up the centrifuge drive system monitor, connected to Siemens S7-315 PLCs. This time, the vertical red lines in the display are not inserted by us. They are in the original footage. The second screen shows a next-generation IR-2 cascade with 15 enrichment stages. Color contrast is enhanced to make the lines stand out. Again, the vertical lines are in the original footage. From those two screen shots it is easy to determine the exact shapes of both the 17 stage IR-1 cascade and the 15 stage IR-2 cascade. Even better, the (non-standard) piping & instrumentation diagrams below the centrifuge drive system monitor area provide excellent insight in the architecture of Iran’s unique cascade protection system, connected to Siemens S7-417 PLCs, which plays a major role in the Stuxnet 417 attack sequence. Besides, it is quite obvious from comparing the different screens, along with other footage, how much the plant design and piping are work in progress.